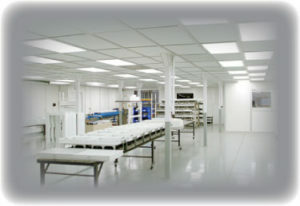 GS Terminal Diffusers are ideal for pharmaceutical companies, manufacturers of medical devices and companies in highly regulated industries. 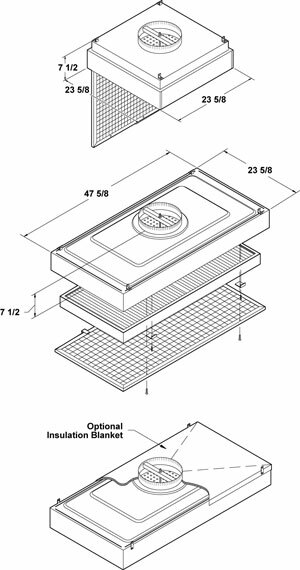 The GS series feature a gel channel on the upstream side of the final filter which provides a leak-free seal between the filter and the housing. 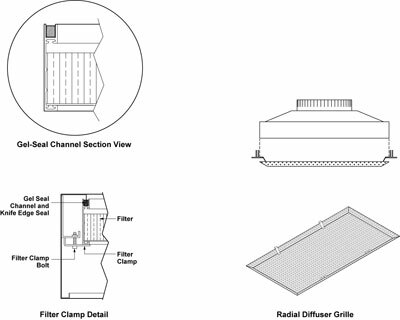 GS Terminal Diffusers feature a HEPA or ULPA filter replaceable from roomside while the filter housing remains in place. The white powdercoated housing, fabricated from 20 gauge steel, is positively sealed to a hood fabricated from galvanized steel. A 10″ or 12″ diameter inlet collar at the center of the filter hood allows for simple field connection to the main air supply using flexible duct. The damper assembly is adjustable from within the room and is supported by a damper support channel permanently attached to the filter hood duct collar. A perforated damper disc is mounted on threaded rod and a guide provides screwdriver adjustments of the damper assembly from roomside. A polystyrene eggcrate grille in an anodized aluminum frame is hinged to open, permitting removal of the filter without removing the unit from the ceiling. Optional perforated stainless steel or aluminum grilles are available. GS Style Filter Data: The gel seal style HEPA Filter is designed for 90 FPM average face velocity @ Initial 0.47 w.g and has a rated efficiency of 99.99% @ 0.3 micron or larger. An anodized aluminum frame holds the 53mm media which is protected by a diamond pattern white epoxy coated steel grille. Final filters are replaceable from roomside. Filter Dimensions: 20-5/8″ x 20-5/8″ x 3″ for 2×2 units and 20-5/8″ x 44-5/8″ x 3″ for 2×4 units. Access Port: This port is located in the center of the filter element face and is used for introducing an up- stream challenge or measuring static pressure. Options: ULPA Filter, thermal insulation, and a range of grille options. 11104 2 x 2 20.62 x 20.62 x 3 10 99.99% @ 0.3 33 lbs. 11105 2 x 2 20.62 x 20.62 x 3 12 99.99% @ 0.3 33 lbs. 11106 2 x 4 20.62 x 44.62 x 3 10 99.99% @ 0.3 57 lbs. 11107 2 x 4 20.62 x 44.62 x 3 12 99.99% @ 0.3 57 lbs.